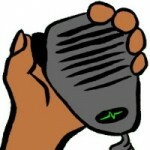 Echolink combines amateur contacts using RF (radio) with the Internet. There are many situations where it’s not possible to make contact with another amateur using radio, when only the Internet will do. Echolink bridges that gap allowing voice and text communication over the Internet. If you’re looking to connect to another station or a conference server from your radio, you will need to be in range of an Echolink repeater. 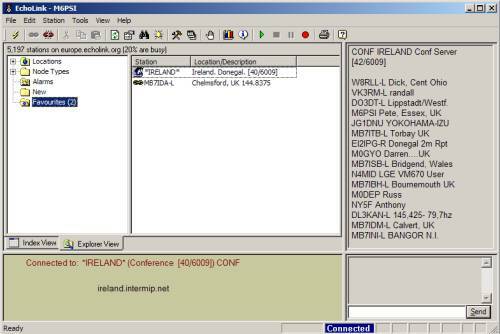 If you want to establish contact with another ham, or connect to a conference server, you will need to know the node number of the ham or server in question. The PC or Smartphone app makes looking for node numbers easy – otherwise, you’ll need to do a web search. 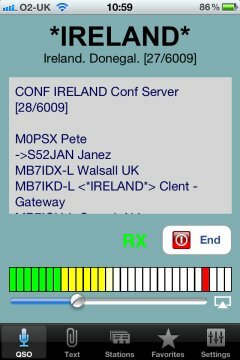 To be able to use Echolink on your PC or smartphone, you need to install the software, register your callsign at www.echolink.org/, and then confirm that you hold a valid amateur radio licence. To prove you have a licence, you are required to either scan and upload an image of the first page of your licence, or fax a copy of your licence to the number provided. You can find out more about how to do this from the Echolink site. A free smartphone app is available, so that you can use Echolink on the move. If you have an iPhone, iPod Touch or an iPad, get Echolink from iTunes. Echolink is also available for Android smartphones and tablets. Hopefully, this gives you a brief overview of what Echolink is all about. If you have any questions, or there’s anything you think we should add, please let us know, or leave a comment below. 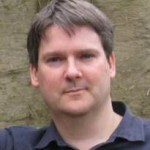 Hi, do you if anyone produces an up to date Irlp or Echolink directory ? Have submitted pdf of my recently renewed Radio Licence to register with Echolink. The new license contains just 3 pages. Echolink have rejected this because it is not part of a 23 page document ? I have investigated Ofcom site where i see my new license but no 23 page documents? I recently looked at ofcom to download a pdf of my licence and as you say there are just 3 pages, the only one supplying information about the individual is page 1. This is now what Ofcom supplies and that should be known by the admins for echolink. As far as I can see there are no 23 page docs. So maybe echolink should publish where these can be obtained.